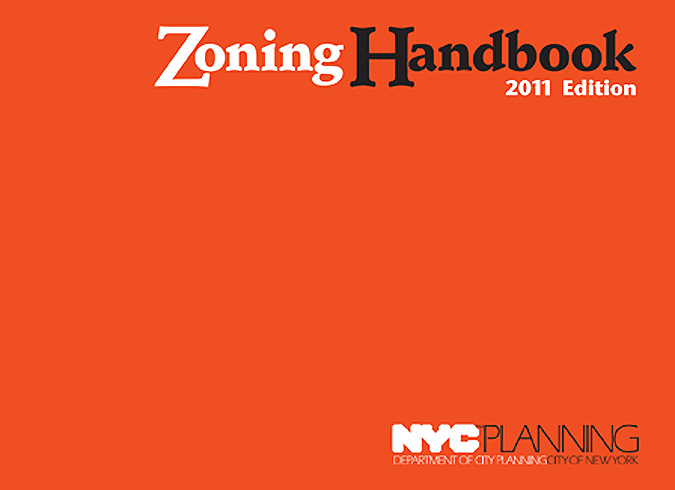 You can’t miss the New York Department of City Planning’s 2011 Zoning Handbook—it’s bright orange. Clear and navigable, the book reads like an intermediate level foreign language textbook. The latest edition, like the 2006 version, includes user-friendly line drawings of buildings connected to cartoon balloons providing detailed information. The new handbook hit the agency’s bookstore yesterday. 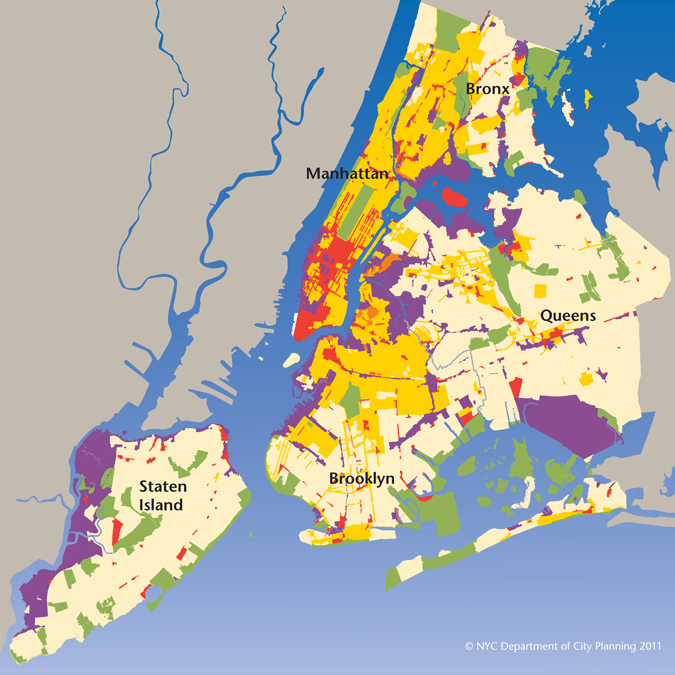 A color coded map of NYC zoning ditricts. Recently, AN reported that a large chunk of Hell’s Kitchen may revert from an M1-5 designation to an M2-4 designation. While that’s not quite how we put it (our article noted that the proposed Hell’s Kitchen commercial district would place height limits at 135 feet) a quick glance at the manual outlines the detailed regulations in surprisingly plain language. The manual goes deep but without getting bogged down in legalese or minutia, offering up the nitty-gritty on everything from parking regulations (none) to setbacks (starting at 85′). 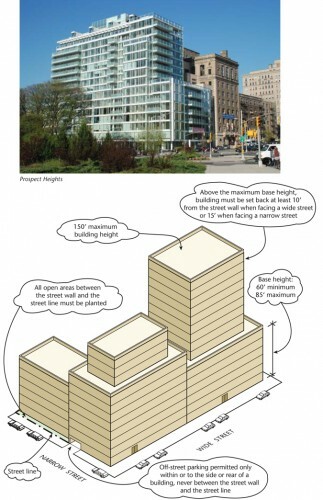 The illustration accompanying the M2-4 explanation features info bubbles that point at two parts of the building: the street wall and the set back, explaining that the building “cannot penetrate sky exposure plane, which begins 85′ above the street line.” Pretty clear. Zoning manual shows requirements for Richard Meier’s Prospect Park building, which falls in an R8X district. As expected, new zoning changes and an update of the Special Purpose Districts were added to the book. But it’s the inclusion of recent initiatives that makes it worth checking out. A press release from the agency noted that during the Bloomberg Administration 9,400 blocks have been rezoned. Much of this activity took place when the city prepared for a bid to host the 2012 Olympics. The release touts that smart growth and sustainable principles that took to the fore in the past nine years. New waterfront design guidelines make it into the text, as do incentives for buildings to provide bicycle parking. A couple of pages are devoted to explaining the FRESH Food Stores Program, a zoning incentive that encourages grocery stores to provide fresh food stores in underserved neighborhoods. A glossary of planning terms assumes the reader is completely new to the subject without being condescending. The book even goes so far as to define the term “building” (a structure that has one or more floors and a roof), but then the elaborates by defining detached, semi-detached, and zero lot line buildings. One section explains how to read zoning maps and another summarizes the NYC Zoning Resolution. There are explanations of the Inclusionary Housing Program, an update on Privately Owned Public Spaces (a.k.a. “POPS”), and a diagram for proper tree planting in parking lots. Public libraries, government officials, and community boards will get copies of the book, which can be bought at the agency’s book store at 22 Reade Street for $35.